Project management software tool ConceptDraw PROJECT allows to organize and manage projects more effectively. ConceptDraw PROJECT is simple project management software for planning project tasks along with project objectives. This flexible tool can be used as your customer project management software or marketing project management software, also it used as simple project management software for software development projects. When do you need Project management Tool? If you are on the fast track in your career and start facing such challenges as coordination many people, coordination tasks and works, manage project with a great deal of time and money involved - it is the right time to get Project management tool involved in your work. Why is it worth investing in Project management tool? With Project management tool you can work more effectively! With Project management tool you can coordinate and manage projects more efficiency! With Project management tool you can save time and money! With Project management tool you can complete projects on time and on budget! With Project management tool you can to get projects dome more quickly and intelligently. Why from a wide range of project management tools it's better to choose ConceptDraw PROJECT management application? Email your projects and project reports as PDF files. No other project management tool gives you all these at such low price! Communication is the main challenge and the key success factor for remote project management. Communicating visually via Skype you bring all team and customers onto the one page. Remote Presentation for Skype solution for ConceptDraw MINDMAP v10 helps communicate with remote team and customers in visual manner on wide range of issues. Using this solution for regular status meetings allows you to push your team on tasks and keep task statuses up to date. Activity Network and Project Evaluation and Review Technique, or PERT, charts are a way of documenting and analyzing the tasks in a project. This diagram is constructed as part of the process in creating a schedule of corrective actions. The Activity Network Chart (PERT) shows the logical connections and consequence of tasks to be performed. It displays the time period for problem solving and the implementation of all activities through the critical path. 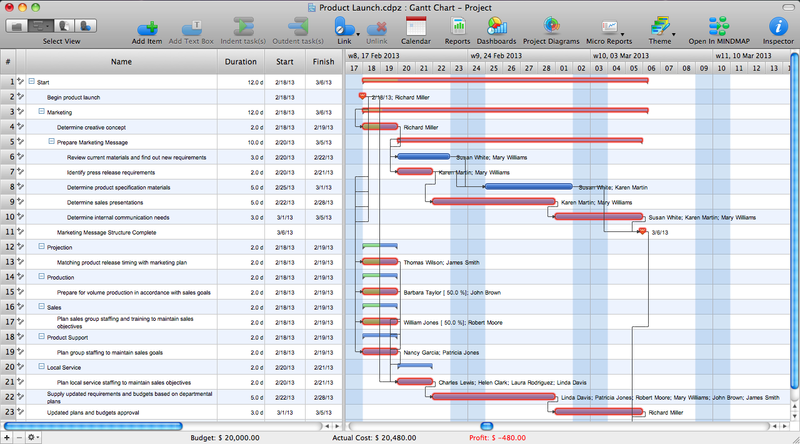 Gant Chart is a graphical representation of tasks as segments on a time scale. It helps plan and monitor project development or resource allocation. The horizontal axis is a time scale, expressed either in absolute or relative time. ConceptDraw PROJECT v9 delivers a rich set of built-in functionalities and optional product extensions that support your daily workflow in time-saving and creative ways. This video lesson will teach you how to work with costs in your project document. Create with our data flow diagram software perfect data flow diagrams. Download data flow diagram software for FREE. Use hundreds of data flow diagram examples. Collaborative Project Management via Skype is an ideal tool for project teams who need to master a growing project complexity. Have you ever needed a flowchart, but did not have the time or tools to build one? Rapid Draw allows you to build a professional flowchart quickly and easily. You have the ability to add your own shapes to Rapid Draw’s built in shape library. ConceptDraw Office is the most effective tool for planning, tracking, and reporting all types of projects with strong management capabilities, user friendly functionality, and superior ease of use. In this tutorial video we will assist you in planning and managing a project using ConceptDraw Office. Users new to ConceptDraw PROJECT v9 will find the Basic lessons an essential platform for familiarizing themselves with the program′s functions. Learn how to assign resources to tasks in ConceptDraw PROJECT v9 with this comprehensive video lesson.